(a) The Guard of Honour, August 11th. 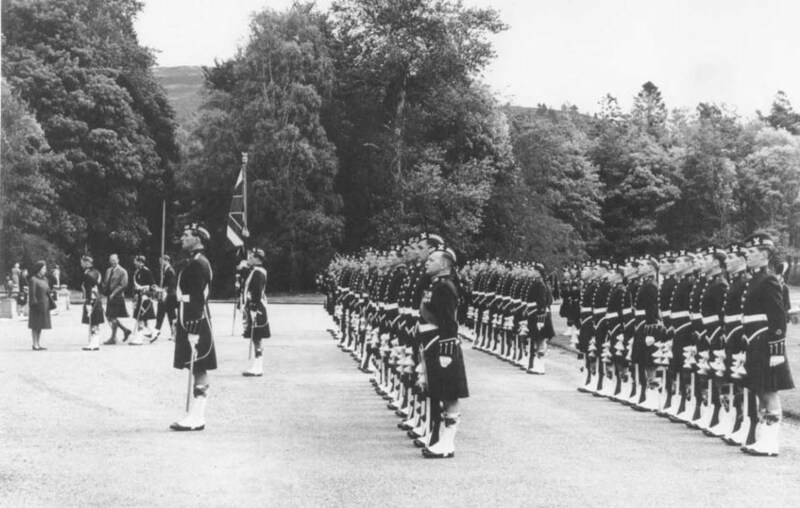 The main body of the Guard arrived at Ballater by train from Edinburgh on Thursday, 2nd August, and immediately started practices and rehearsals for the Guard of Honour for H.M. The Queen's arrival at Ballater Station on Saturday, 11th August. Provost Anderson of Ballater was particularly helpful with advice and co-operation during this preparatory stage. The Pipes and Drums arrived up in time on D -l to attend a final rehearsal in the Station Square and all was finally set for the day. 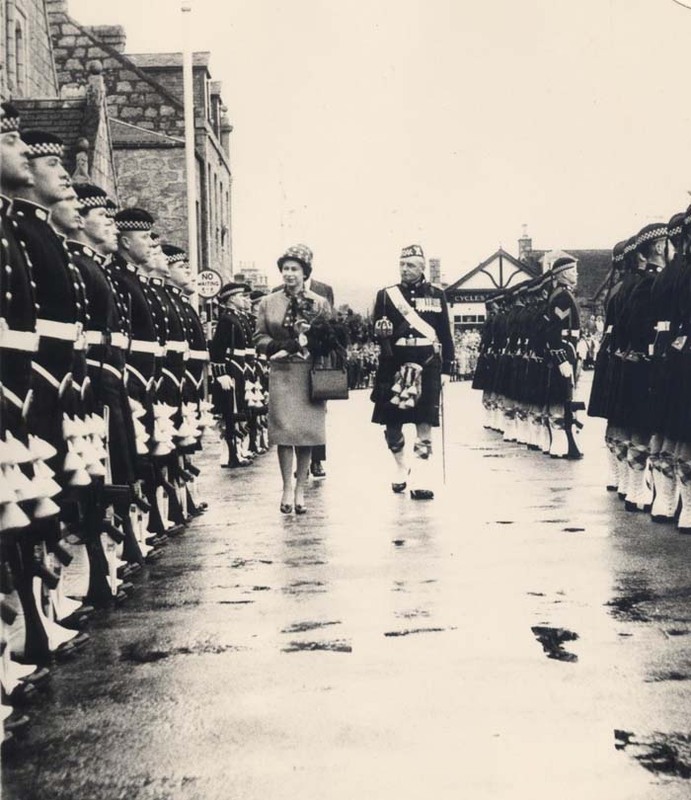 At exactly 09.40 hours the Royal train drew into Ballater Station and The Queen having-inspected the Guard of Honour drove off to Balmoral with the Royal children to begin her annual holiday. 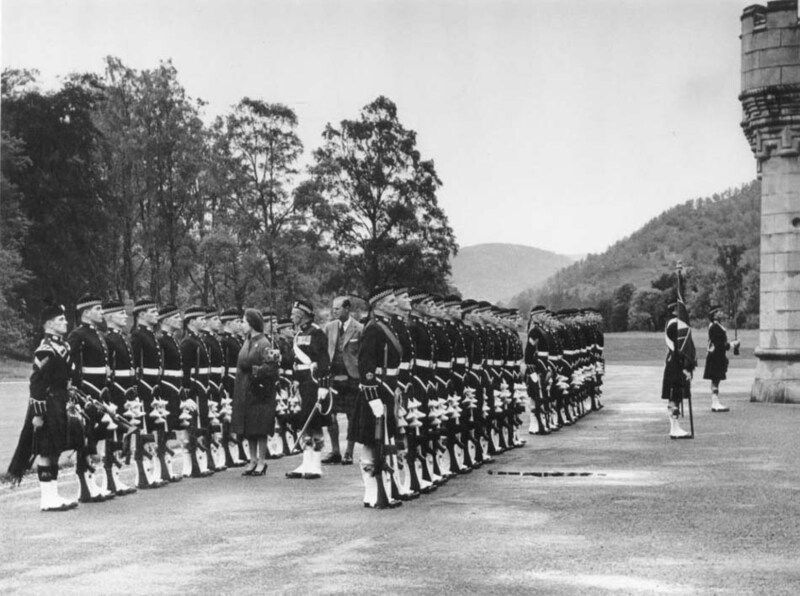 Beginning on Sunday, 12th August, and for the next eight Sundays until the Guard dismounted on 3rd October, four officers and forty ORs formed a Guard and marched to Crathie Church for morning service behind Piper Craig, who was later replaced by Corporal Ogilvie. (c) The Guard of Honour, September 30th. The Guard was granted the privilege of mounting a final Guard of Honour on Sunday, 30th September. 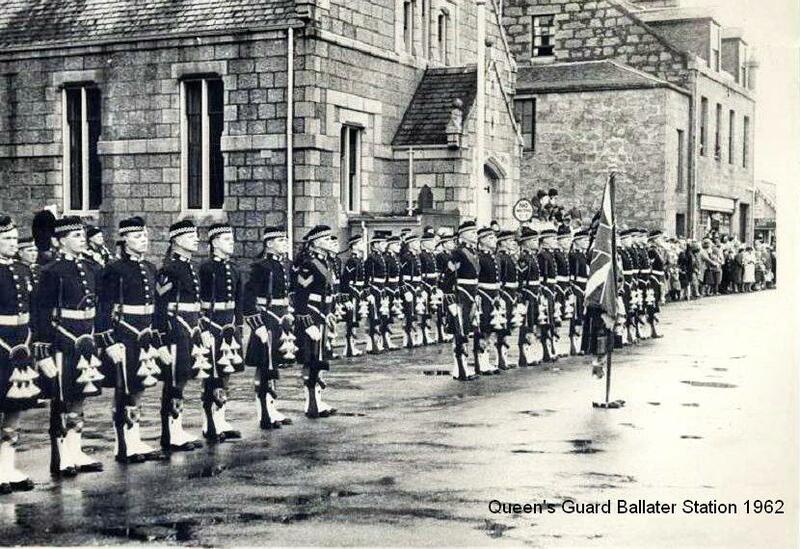 This was held privately in front of Balmoral Castle and was inspected by The Queen with Prince Philip in attendance. There were no spectators, but Mr Reid. 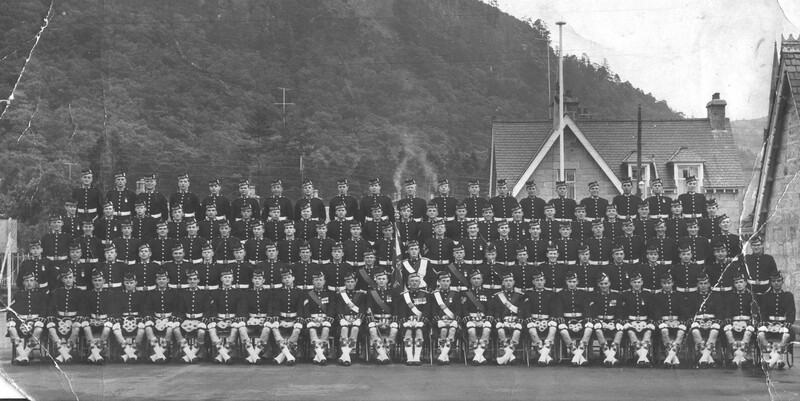 the Ballater photographer, was given special permission to be present. 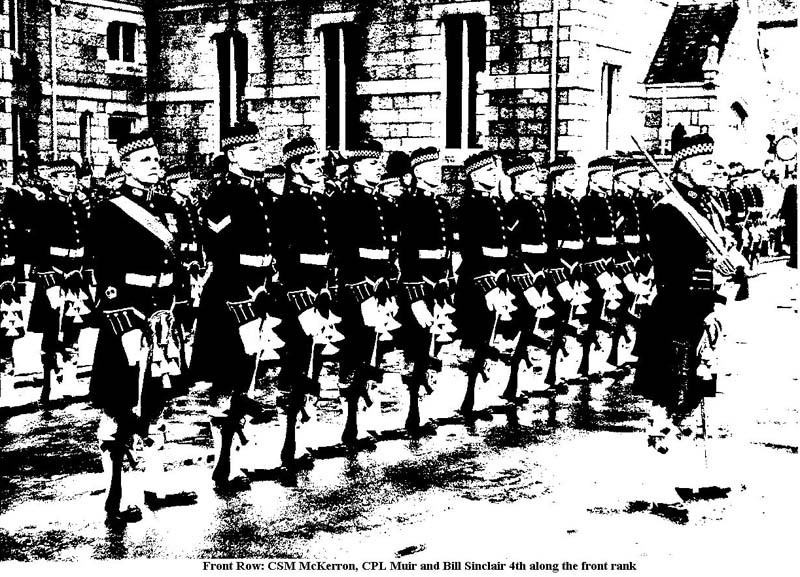 Throughout its tour of duty the Guard was required to find nine men to augment the regular Castle staff and to work permanently in various departments of the household. 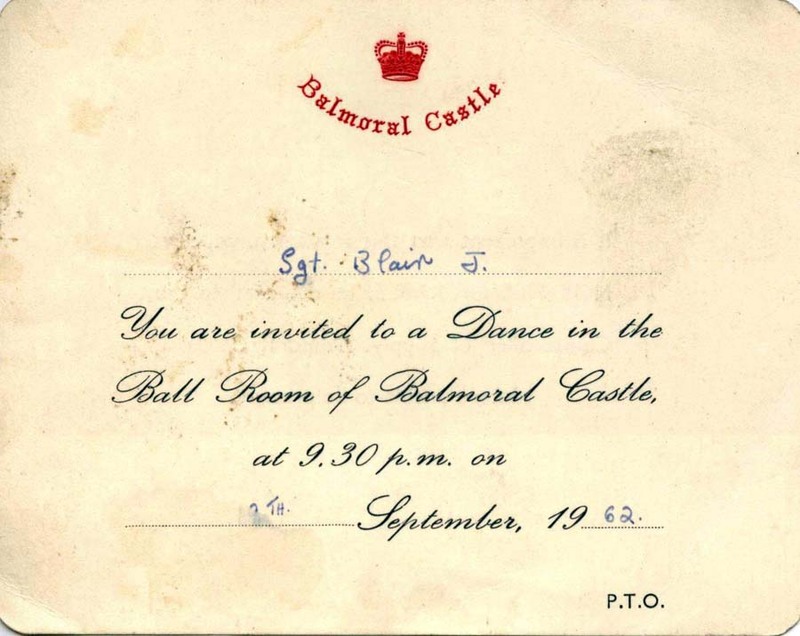 This was a popular duty, particularly among those accommodated at Balmoral; the original selection from the many volunteers proved an excellent team under Corporal Hill and earned high praise from the Controller of the Household. the standard of beating achieved was good enough to please Gillan, the head-keeper, and to provide a total bag for the guns of over 2,200 brace which was considerably higher than anticipated at the beginning of the season. The teams finally chosen were Ptes Crawford and McNeill at the Glas-Allt, L/Cpl Fraser and Pte Miller (86) at the Spittal, and L/Cpl Simmonds and Pte Miller (63) for the Balmoral Home beat. They were in full charge of their respective ponies, for their care and upkeep both on and off the hill, and they worked together on the hill under the beat-stalker whenever their beat was being stalked. In the case of Crawford and McNeill who lived alone at the top of Loch Muick they had to be self-supporting in every way, an order which they may have translated rather too literally at times (! ); however they managed to evade detection when it mattered most and to keep discreetly away from the Royal picnic and barbecue parties held on their doorstep. L/Cpl Fraser and Pte Miller (85) were nearer civilisation and were indeed lucky in having Mrs Robertson, wife of the Spittal stalker, to cook for them and generally look after them. It required hard work for all concerned to reach the quota of 120 stags by 20th October and the ponymen stayed on after the departure of the rest of the Guard to help achieve this. The Queen herself is, of course, immensely interested in all aspects of the sport; on the few occasions when she could spare the time to stalk she was invariably successful and always a sure shot. 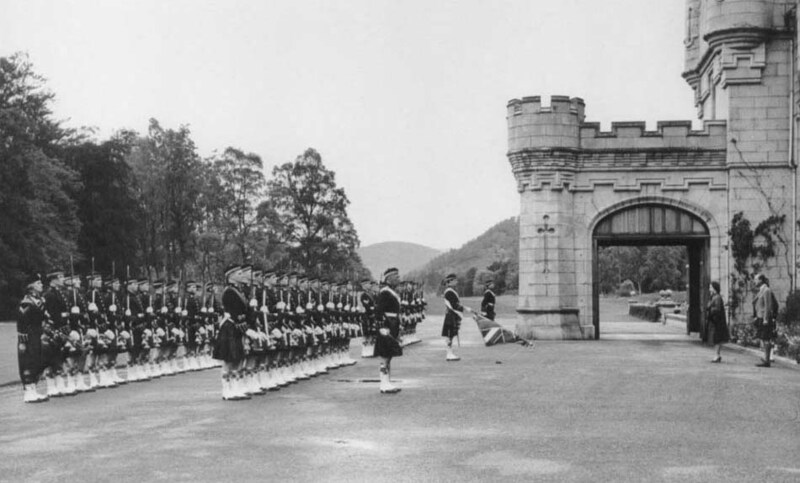 Once the blue paint which the KOSBs had splashed around the previous year had been replaced with the more familiar green, the barracks proved to be a very adequate home for the Guard for its two month tour of duty. They are a miniature barracks in every respect so there was no spare storage or bed space once the whole Guard had moved in. The most complicated thing about Victoria Barracks is its antiquated telephone exchange; this gadget had to be mastered by all NCOs at once and by private soldiers as soon as possible. In reality some including the OC Guard were still baffled by it at the end of the tour. It came as a considerable shock to members of the Guard to find that there was no cinema operating in Ballater; the recent proprietor had had to close his business down through lack of customers. This deficiency was largely made good by the gracious gesture by the Queen herself who provided a television set in the Canteen in the barracks. 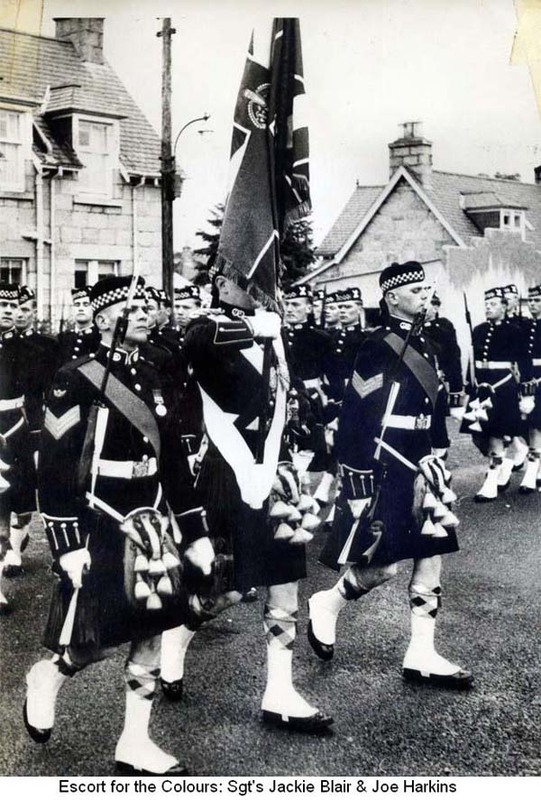 Other activities included fishing, football, participation in the Ballater Highland Games (on the wettest day of the year), visits to Aberdeen and a great deal of dancing. 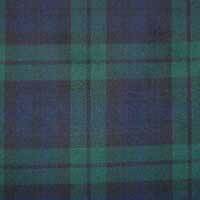 The Jock dance-diary was a full one:—Wednesday, Birkhall or Balmoral Staff Dance; Thursday, Friday and Saturday, dances in Ballater, Dinnet or Braemar. The Sergeant's Mess concentrated on golf to such good purpose that the Officers' Mess had to ensure a rather too heavy crop of shooting and stalking invitations to be able to accept their challenge. It must also be admitted that fishing Jock-style was infinitely more productive than were the officers on the Abergeldie beat of the Dee. Some quite good trout were caught in the River Gairn but in same mysterious way the best fish to land up in Victoria Barracks was as a result of a day on Black Dog Range, outside Aberdeen.